Working at the intersection of the formal and informal economy, Leon Mdiya is opening eyes on both sides of the divide. Common sense is the guiding force in the life of Leon Mdiya – if an idea isn’t plain and simply logical, it’s not worth pursuing. This philosophy makes Mdiya perfect for the company he founded eight years ago, Future Space Solutions. It focuses on exposing people to environments they don’t normally engage with, opening their eyes to opportunity and potential they never knew existed. It is at the interface of South Africa’s two business worlds that Mdiya is making an impact – the first world, established sphere of big business and office blocks, and the informal trade of the townships, where sheer necessity conceives inspired ideas that make the very common sense Mdiya finds so appealing. Mdiya spends much of his time combing South African townships for informal business models that work. He formulates programmes to introduce them to groups of leading businessmen, movers and shakers. He takes the suits to dusty streets, immersing them in local trade and culture, arranging overnight visits at local B&Bs, entertaining them at neighbourhood shebeens and shepherding them around in minibus taxis. “It’s a 360 degree experience,” he states. Light bulbs go on and blinkers come off on both sides of the divide, new ventures are sparked, and at the very least insights are gleaned that improve understanding and relationships. Even businessmen raised in the very townships Leon lays bare are often amazed at what they’ve missed in their own backyards. Mdiya is a master at exposing the invisible. The innovation Mdiya reveals is extraordinary, and all the more encouraging when viewed against the limited resources with which they operate. It belies the impression that township residents languor in poverty and pessimism, waiting for government handouts. Take Sizwe Nzima, for example, from Khayelitsha outside Cape Town. Collecting prescription medication from a crowded hospital on a monthly basis for his grandparents, he realised that if he expanded his service and collected medicines for other chronically ill patients, he could save them hours of queuing. He now runs Iyeza Express, employing a team of bicycle couriers to collect and deliver medicine at low cost to a growing list of clients. Guests get an introduction to Department of Coffee in Khayelitsha, Cape Town, South Africa. Enjoying coffee at Department of Coffee. Mdiya, himself a former high school teacher, left the profession when he could no longer find his way around “stuck thinking”. He became co-ordinator for a child and family centre in Joubert Park, one of the most densely-packed neighbourhoods in Johannesburg’s inner city. While running this NGO, he participated in a leadership programme for middle managers offered by the Gordon Institute of Business Science (GIBS). 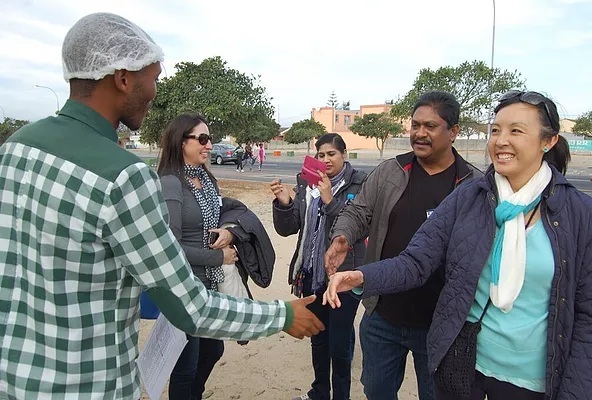 The programme offered field trips in quest of learning about South African socio-economics. 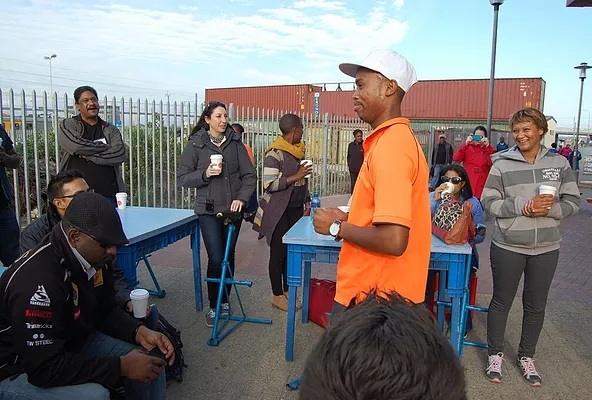 In the same township, three youngsters – Wongama Baleni, Vusumzi Mamile and Vuyile Msaku – have started Khayelitsha’s first artisan coffee shop at the local station, serving commuters as they start the day. Called the Department of Coffee, its facilities are basic – furniture consists of unadorned trestle tables and old crates for seating. But great care has gone into researching the coffee blends, from the robust Runaway blend to the more docile Umlungu, and to consistent branding on uniforms, menus, cups and packaging. The team also operates a mobile coffee shop and can be found at spots around the Cape Peninsula on weekends. Here too Lefefe Nomjana runs a bakery where they key ingredient is healthy spinach. At Espinaca Innovations, located in a converted container, he bakes a range of preservative-free goods including muffins and biscuits, with organically-grown spinach for health and taste. 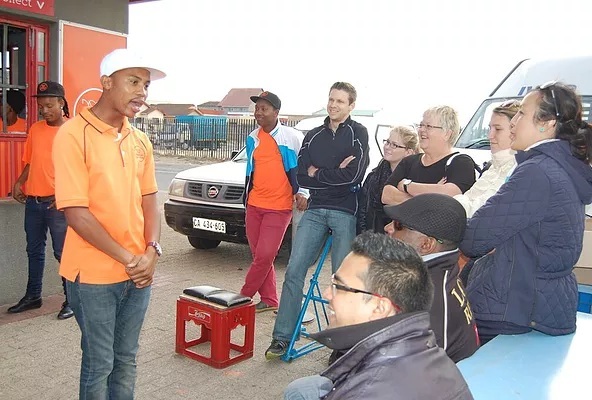 And in Soweto, local resident Mnguni Mathole, uses his humble, four-roomed house as an after-school maths project, bettering the skills of some 250 kids a week in a country where maths teaching skills are left wanting. “They were a revelation. I saw naiveté on both sides – corporate business was often ignorant of real township issues, while township entrepreneurs who were getting results, were puzzled as to why funding remained elusive. I realised that no matter how good they were on the ground, if they couldn’t translate their concepts into a business document, they wouldn’t get big business to release the purse strings. There was a disconnect that had to be addressed,” he says. Mdiya went on to work for GIBS, developing new programmes for the business school, until 2007 when he formed Future Space Solutions. While GIBS remains a major client, he deals with a wide range of organisations and corporates wanting to explore beyond the boundaries of conventional businesses. He’s hosted JSE-listed corporations, educators, diplomats, church and youth groups, local and international tourists. His classroom now extends further and wider than ever, to any township in the country. Wherever clients express an interest, Mdiya will scout for pioneering businesses that spot a gap, embrace innovation… and make sense.